In August 2012, RESPEC was contracted to provide field instrumentation and early-warning monitoring services at a developing sinkhole on the western flank of the Napoleonville salt dome in Louisiana. A deep underground salt-brine cavern had experienced a structural breach, which allowed the surrounding sediments to flow into the cavern, cause a sinkhole at the surface, and liberate gases from the disturbed sediments. Over time the sinkhole grew to over 40 acres in size and was over 400 feet deep at its maximum depth. RESPEC engineers deployed a real-time early-warning system to continually monitor the tilt and water levels around the developing sinkhole. The sinkhole is in a coastal cypress swamp, so the monitoring system had to operate in harsh conditions (e.g., intense heat, extreme humidity, hurricanes and heavy rains, and insects) with minimal maintenance. The system consisted of Campbell Scientific data loggers, tiltmeters, inclinometers, and water-level transducers. Data was continuously collected by an array of more than 30 CR206X loggers located throughout the swamp, and transferred in real time via RF401A radios to CR800, CR1000, and CR6 routers and base stations. The base stations were equipped with LS300 and RV50 cellular modems and sent data out to a secure server, then to real-time visualization software Vista Data Vision. The telemetry network allowed two-way communication so that data could be gathered remotely, and the data loggers and sensors in the field could be reprogrammed or reconfigured from the office. The intent of instrumentation and data collection was twofold. The primary purpose was to develop an early-warning alert system that would notify local response crews of imminent and catastrophic ground movement, before large masses sloughed off and sank into the sinkhole. Using the first few months of data, project engineers determined that sloughing events were typically preceded by several days of slight ground tilt. Early warning was then accomplished by setting alarm thresholds on tilt readings from devices stationed at the sinkhole periphery and on infrastructure located nearby. When tilt exceeded alarm thresholds, the Vista Data Vision software would send text alerts to project engineers and on-site personnel managers. The other project requirement was to determine subsidence rates in swampy areas around the sinkhole. Performing conventional optical level-line surveying methods would have been difficult, if not impossible, from the airboats that provided the only access to the swamp area around the sinkhole. RESPEC developed a novel subsidence-monitoring system using differential water-level data to measure the ground subsidence to within 6 mm (0.02 feet) per year. To accomplish this, 2-inch steel posts were driven 10 feet into the swamp bottom to anchor equipment at each site. Pressure transducers were installed at each location and read by CR206X dataloggers, which transmitted data through repeaters to the base stations with cell modems. Each station was equipped with a staff gage to verify and adjust the transducer offset over time. Differential water-level data from the swamp-based water-level monitors were combined with InSAR data and traditional elevation survey data from roads and berms to create subsidence-rate contours over a large areal extent. Using these techniques engineers were able to calculate subsidence rates in swamp areas around the sinkhole as low as tenths of an inch per year. Other project aspects included using Campbell loggers to monitor tilt in deep sediments using in-place inclinometer strings made by DGSI, communicating with a deep-well Baker-Hughes pressure tool using Modbus, and measuring gas-flow rates from vent wells. In the first case, tilt data was used to determine risk and effects to a berm that was constructed to prevent sinkhole water from entering a nearby bayou. The project was highly scrutinized within the political and public sectors, required close collaboration with the client, multiple consultants, and government agencies, and demanded high flexibility due to rapidly changing conditions. 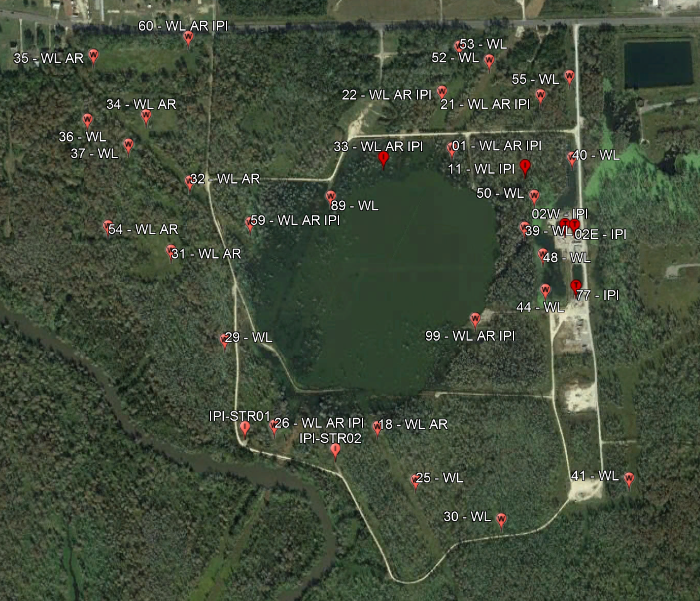 Over 40 Campbell Scientific data loggers were installed in a swamp for over 4 years. During this time, they only lost three. Two sank into the sinkhole, and the other received a direct hit by lightning! See web page for more info: http://www.respec.com/project/napoleonville-salt-dome-sinkhole-monitoring.